Nigerian Afrobeat originator Fela Anikulapo-Kuti was an unrelenting activist for his people. Song titles like, ‘Teacher Don’t Teach Me Nonsense,’ U Be Thief’ and ‘Sorrow, Tears and Blood’ convey their struggle for truth and justice. Alive with the rhythms and fire of the man himself, his songs still have the power to inspire. Mixing English with his native tongue, often donned in traditional garb, face and body painted with ghostly white symbols and patterns, Fela and his band Africa 70 charted musical waters and political landscapes previously un-navigated. ‘We’ve got to fight for justice,’ Fela sang ceaselessly in his music and dance filled club in Lagos. This show seeks to recreate the last night in Fela’s Shrine, in summer, 1978, six months after the death of his mother, Funmilayo, who’d been murdered by police during a raid there. Fela! is infused with the colour, atmosphere and provocative energy expended in that legendary place. If you go to your seat before curtain up, you’ll be treated to the tightly infectious playing of the ‘Shrine’s’ band, setting the tone via relentless drumming and strident horn playing beneath strings of glowing amber, yellow and orange light bulbs. Similar lights arching over the stalls and out sized, crudely executed paintings on the walls enhance the feeling that theatre-goers are part of the experience. Dancers undulate to drums as the lights go down evoking Nigerian spirit as the man himself appears, addressing the audience directly. ‘Say yay, yay,’ he cries, which everyone immediately does. He puts one hand to his ear, ‘Yay, Yay,’ he says, the (? Implied) We shout it again, this time louder, with more gusto. 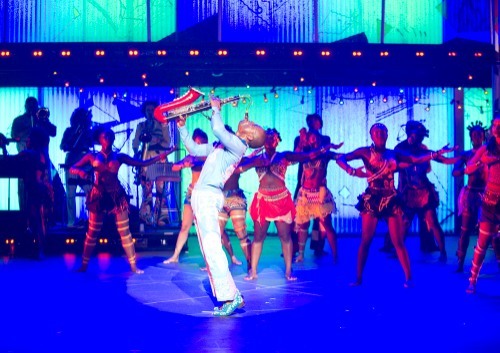 Sahr Nigaujah fully inhabits his Fela, confidentially bantering with the audience, setting scenes, singing, playing sax and trumpet, flirting with his ‘wives’ and enabling us to know the man as activist and musician. In the process, we understand why it was vital for Fela to persistently defy political corruption in the name of his people, thus strengthening the glare of publicity on the grim truths he sang of. ‘Zombie’ about the military regime continually turning a blind eye to injustice, became an international dance hit, empowering the cause while bringing suffering on its leaders via violent retribution. But nothing stopped Fela, and this musical is a tribute to his drive, tenacity and honour, best expressed through his timeless and ever topical musical legacy. It’s truly amazing how successfully this musical evokes the spirit of Fela’s music and politics. Having watched a rare clip of lively activities in the Shrine itself on YouTube, as filmed by British rocker Ginger Baker in the late ‘60’s, I had a sense of the raw, passionate power Fela exuded, as well as the energy and determination he inspired in those around him. Fela!, the musical has managed to capture that and however encapsulated within the time allotted, it’s very powerful. There are many facets to the storyline of this show: the mysticism of Nigeria, Fela’s close relationship with his activist mother, and the ways in which his life was informed by his English education and liaisons with the US ‘Black Power’ movement figuring prominently among them. There is not one scene that doesn’t focus on the politics of Fela, personal and/or political, in turn, reflecting on our own. As one incendiary and intriguing scenario after another unfolds, we are taken on a journey through the fascinating life of this courageous activist and his turbulent times. Yet, there is humour too, as humour was inherent to Fela, oft via his knowing but witty observations aimed at extracting truth. So we laugh with him, as we admire and fear for him too. The show’s dancing is dazzling, awe-inspiring, beyond athletic and highly evocative, drawing cheers and applause after each and every number. Its’ impact is equaled only by Fela Kuti’s hugely infectious music, as played onstage by a group of high caliber, diverse musicians who know how to wring every bit of Afro from Fela’s funk. Then too, we enjoy the harmonious, variegated singing of the multi-talented cast, who singly and collectively respond emotively to Fela’s sung calls. The combined results of the music, dancing and singing in this show would be enough to send anyone home happy, without anything more. But when they are crowned by Sahr Nigaujah’s rightfully acclaimed performance as Fela, which effectively blurs the lines between him and the real man, despite physical differences, one moves onto even higher ground. I’ve been to countless musicals, but I’ve never been to one at which each and every number was met with such rapturous applause! The only possible way in which this experience could be heightened would be if the seats were removed to allow for dancing, at which time, I’m sure the audience would forget they weren’t in the Shrine itself! Marvelous staging is another major contributor to this show’s success, as the audience is privy to a multitude of news headlines and stories about Fela Kuti on a wrap around screen above the stage, and two smaller ones on side walls, courtesy of Peter Nigrini’s projection designs. The screens also display chilling video footage of the violent Nigerian militarism of Fela’s time and historical images, as well as abstracted rain for one song, a sense of water for another speaking of how precious and useful it is, and shifting patterns enhancing the show’s sense of continual movement and passage of time. There are also simple but effective set pieces such as a balcony level performance space above the stage and a tall platform with steps, used in emotionally charged scenes with Fela and his late mother, Funmilayla, who intermittently appears in heavenly white. Melanie Marshall, who plays Funmilayo, deserves special mention for her thrilling, operatic vocal performances, which drew thunderous applause following each of her two solo numbers. Robert Kaplowitz’s lighting is similarly mood-enhancing, with playful colours and shapes tripping over writhing dancers and soft bursts of what seems like morning sunlight pouring over Fela’s mother’s spirit as she passes back into the world of the ancestors. Robert Kaplowitz’s sound design is also evocative, heightening tension at especially pivotal moments of Fela’s tale. Rituals were part of Fela’s world, especially in the Shrine, and the mysticism of the ancestors also informs the leaping, bouncing and gyrating of the dancers, the music, and the atmosphere itself. An opaque screen with crocodiles scurrying across it cleverly divides the stage in one scene, as dancers twirl in black lighted, white costumes, reminding us of ghostly worlds. In another particularly potent scene, a number of small coffins bearing the words: BP, Utoya, News of the World and other ever topical corporate references, as well as facets of the human condition, among them, doubt and fear are carried to the stage by cast members, and stacked so their labels are visible. Other notoriously shameless corporations known to destroy communities and the lives of those inhabiting them are also prominently named, including RBS, Shell and Monsanto. When Fela Kuti died on August 2, 1997, millions of people took part in a 24 hour procession – to the Shrine. For the price of a theatre ticket, you can, in a sense, go there yourself, and in the course of one riveting performance of this incredibly evocative show, begin to understand why.